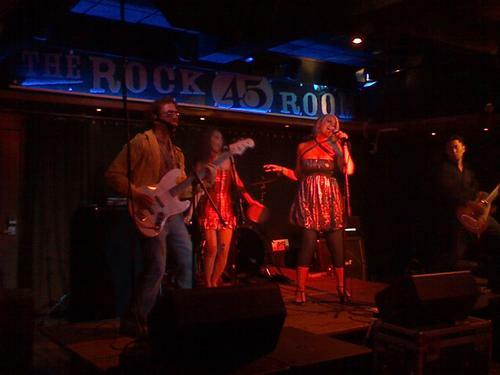 I managed to catch a portion of Audio Fiction’s show at Rock Room 45 last night. It was a really fun show -- the crowd was energetic and the band was great! 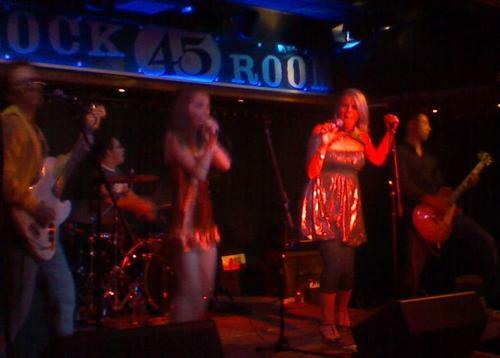 Ok, I have to say I’m slightly biased because Darren (on bass) is my karaoke-duet-partner-in-crime. I was really excited to finally see him perform live (and to check out the new ‘stache). The only bad think about the night was I couldn’t stay for the whole show! Lulu and Kristin on vocals have really great stage presence. They looked like they were having so much fun on stage, I just wanted to jump around with them. How can I describe their sound? Hrm, a cross between punk-rock and pop but overall awesomeness. I can’t really say much because I only caught two of the songs before I had to head down to S.O.B's but I can’t wait for their next show and to hear more of their songs. When are they playing next? I wanna check them out! 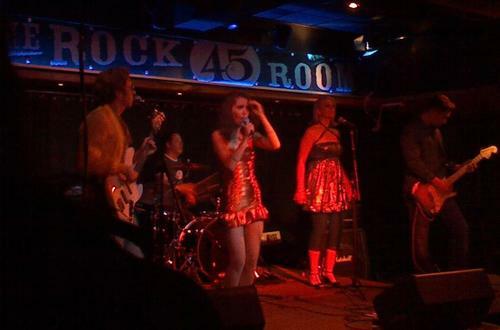 where is rock room 45? is it a decent venue? Mike, not sure. Darren says they don't have any scheduled shows but I'll post when they do. Marisol, its on 45th off of Times Sq on the third floor of Connolly's.. its small but I liked it!